Why be an IELTS trainer you ask? Here are some interesting facts that will help you understand the importance of this field and the reason why it can be a lucrative career option. We are a land of diverse languages and yet we are second largest English speaking country in the world! Second only to USA! Another interesting fact is that nearly 3 lakh students go abroad every year for higher education. 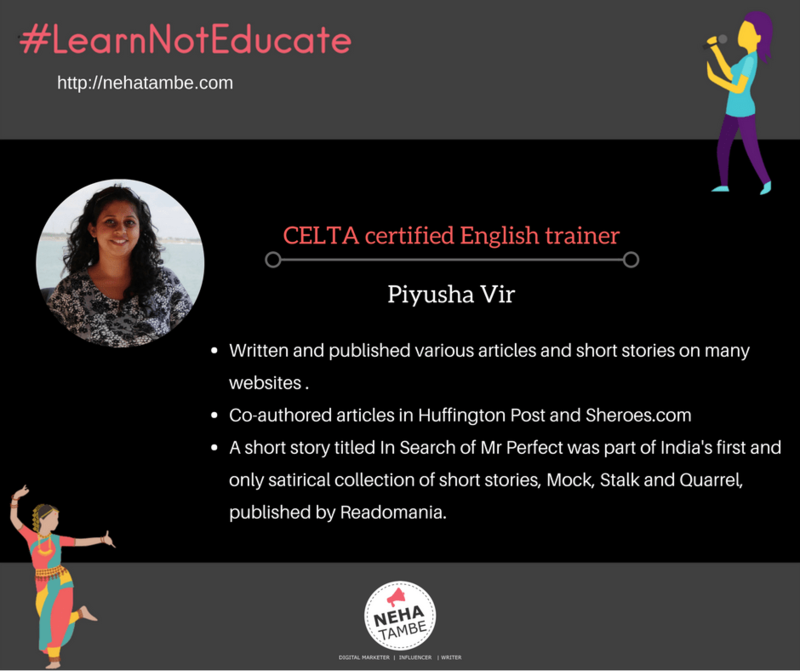 During the #BlogchatterProjects I met Piyusha Vir who is a CELTA certified English trainer. She explained that CLETA was the certification required for teaching English as a second language. After a long stint in the hotel industry, I quit my job and turned a full-time writer in 2015. Since then I have written and published various articles and short stories on many websites and magazines including Readomania.com, Sheroes.com, MyCity4Kids, WomensWeb, and LBB Delhi. I recently completed my CELTA certification for teaching English as a Second Language from University of Cambridge. How and why did you decide to get a CELTA certification ? I saw the need for writers and even, non-writers to improve their English language skills. Communicating in the English language isn’t one of the strengths for most Indians. During my interactions with other writers, I realized they may have brilliant ideas for their stories but their expression lacks finesse. This is why I decided to teach English to writers, but I needed a formal certification to make sure I was using the right techniques and methodologies. That’s when I did some research and found out that the CELTA qualification was the best and the most respected one. With this qualification, I can choose to be an IELTS trainer too. One needs to be a graduate in any field. Applicants wishing to apply for the CELTA course need not have studied English language at college or university level. Of course, they need to have exceptional English language skills. One can take the CELTA as a full time, part time or online. In India, at present, only the full-time option is available. To apply, one needs to register and send a request directly to the authorized centre. Are there any institutes or universities giving structured courses in it? In India, British Council is the only approved centre offering this course. It is as per the standards and course guidelines set by Cambridge English Language Assesment, a part of University of Cambridge. Any tips for those looking to pursue this course? Anyone looking to take the CELTA should be well aware what they are getting into. It isn’t an easy course. Even the application process has three stages. The course is really intensive and draining. You won’t be able to pursue it along with any project/job/course. What are the career options after finishing this course? There are many career options post CELTA. One can choose to teach at schools, colleges, set up their own coaching/tuition centre, or even coach IELTS and TOEFL candidates. CELTA is just like any other professional course. They do not offer any placement service/assistance and one is expected to look for jobs independently. You can connect with Piyusha for more information on her blog, Twitter or Facebook page. She even has a free course for those who wish to learn English on Skillshare. Very interesting. This was unheard of but looks quite promising. Thanks for sharing the experience and tips!